I continue my look through newly-released data from the National Postsecondary Student Aid Study by turning to trends in the net price of attendance by family income. The net price, which is the full cost of attendance (tuition and fees, books and supplies, room and board, and miscellaneous living expenses) less all grant aid received, is a key college affordability measure as it represents how much money students and their families have to come up with each year to attend college. This net price can be covered by a combination of savings, work income, and student loans, but it is worth noting that student loan limits for many undergraduate students are far below the net price. This means that many families face challenges in paying for college if the net price is a large share of their income. 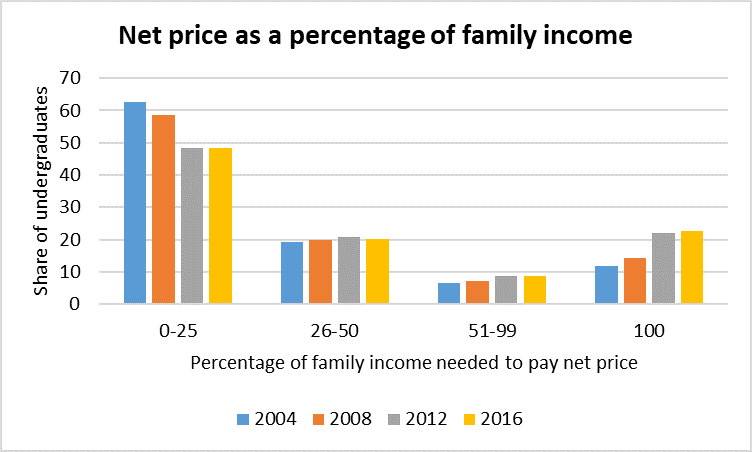 The first figure here shows trends (since 2004) in the percentage of family income needed to cover the net price. 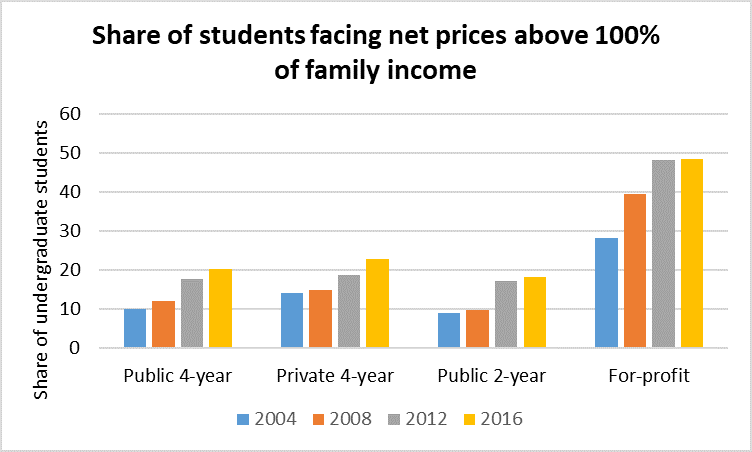 In 2015-16, 48% of students faced net prices of less than 25% of their family income, 20% were between 26% and 50%, 9% were between 51% and 99%, and 23% of students had net prices greater than their family incomes. The good news is that the distribution of net prices held almost constant since 2011-12 after having taken a jump during the Great Recession. In the second figure, I break down the percentage of students with net prices higher than their family income by type of college attended. Nearly half of students attending for-profit college were in this category, which is not surprising given the high prices charged by many for-profit colleges and students’ low household incomes. About one in five students attending public and private nonprofit four-year colleges are also in this category. Meanwhile, even 18% of community college students had net prices higher than their family’s income, which is a particular concern as quite a few colleges do not allow their students to take out federal loans. How do you define income? If agi is used, are those with negative incomes falling into the 100% of income is going towards net price? I don’t think they used AGI, since there are no negative incomes reported (and only a small percentage of zeroes).